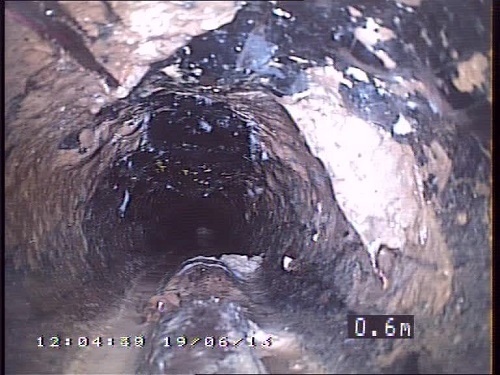 We attended a blocked drain in Longstanton at the end of November 2014, 10 years after our client had a very well-known national company unblock it. We were 5% cheaper than the price they charged then! £89 represents such good value for money. Click on prices to see what we mean by affordable expertise. 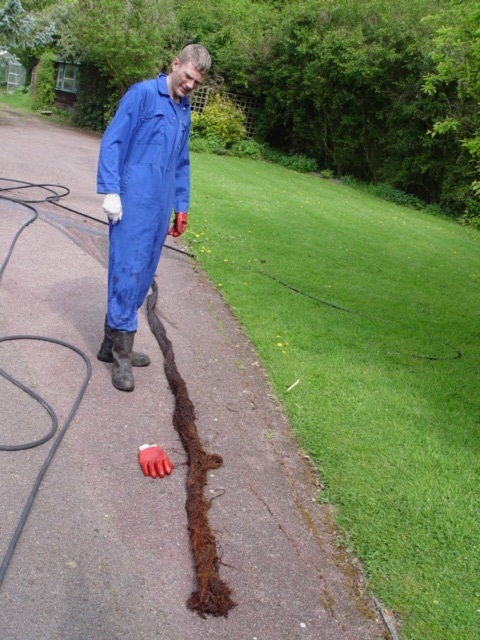 A Cambridge professor called for our help when he tried to clear an overflowing storm down pipe at his house by removing the bottom elbow at ground level, only to find it was still totally blocked; as this lead to a soakaway he feared he might have to renew the drain and soakaway itself. 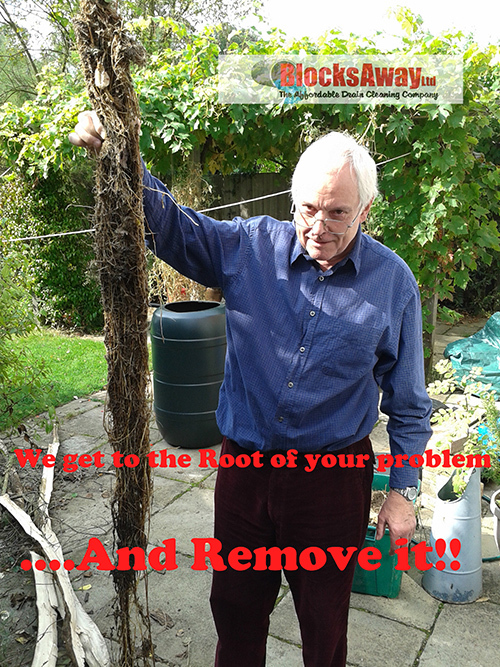 Blocksaway gained access and removed huge bundles of roots that had grown into the drain and totally filled it. There was therefore no need for an expensive excavation. The nearby tree was for the chop! “I was very pleased with your prompt, punctual and efficient service and your entertaining and instructive conversation. I also thought the fee was pretty reasonable, especially given the quickness of your response and the fact that you didn’t charge me for running over the first hour (as you did). Anyway, thanks so much, and next time I’m in a fix I shall call you up. And also recommend you to other distraught householders. 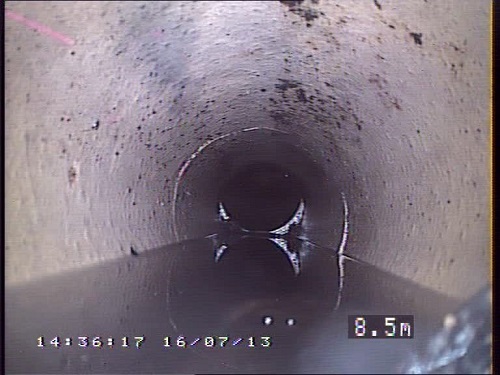 Blocksaway was called out to a house being sold in Eye near Peterborough by the local estate agent on behalf of the purchaser to complete a CCTV survey of the drains. 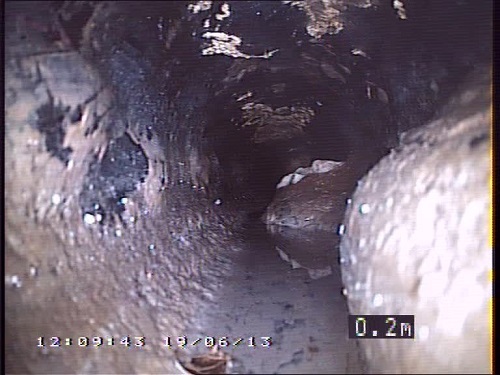 The survey revealed a very heavy buildup of scale in the foul drain that lead under the sun lounge. The purchaser insisted this be removed before he would agree to buy the house. Steve high pressure water jetted the run at 4000psi but only managed to remove some of the scale which was like concrete and up to 2″ thick. Undeterred and by using special acid behind the remaining scale overnight on 2 separate occasions, Steve totally cleaned the drain and brought it back to full bore. The alternative would have been a lost sale or an excavation costing thousands of pounds. Pitch fibre pipes were first used for drainage in the UK in the 1950s, because they were cheaper than conventional fired clay pipes; their manufacture ceased in 1984. They are made of wood fibre impregnated with coal tar and are susceptible to delamination of their inner surface, tree root encroachment and damage from the passage of heavy vehicles. Their average life is reckoned to be at best some 60 years, but the failures in these pipes have also been exacerbated by poor initial installation; unlike clay pipes, pitch fibre pipes require a granular bed and higher compaction and this was not fully realized before 1973! So what happens is that pitch fibre pipes can become deformed over time, no longer keeping their round profile, looking more like a squashed sausage and causing frequent blockages and eventually total failure of the drainage system. Where a building survey or an RICS Homebuyer service is being undertaken, Blocksaway Ltd. highly recommend the addition of a CCTV survey of the drainage before purchase, often at a cost of as little as £125; insurers are seeking to minimize their liability for pitch fibre drainage problems, and it is well worth establishing the condition and nature of pipework prior to purchasing a property. I thought you might like a testimonial as well as the photo. Strange smell in bead shop!! Called to a jewellery/bead shop on the Green in the cathedral town of Ely, Blocksaway Ltd. were asked to investigate the source of a concerning sewage smell. Using our camera we were able to locate the source of the problem: the soil vent pipe, which was hidden behind panelling, had come apart half way up allowing smells into the second floor of the 2 storey building. We have recently introduced a new Septic tank conversion service. For full details of this service and how it can benefit owners of Septic Tank systems please see our service page. Drain tracing in Newmarket is not always as straightforward as it could be for Blocksaway; when extraneous wireless signals were interfering with the signal from our conventional drain tracing probe, Steve sent his jetting hose down the drain and attached a pulse generator to the metal hose connector on the reel: he was then able to accurately detect the metal braided hose and therefore the drain from the surface. The Blocksaway motto : Never give up! A foul smell cured at last! 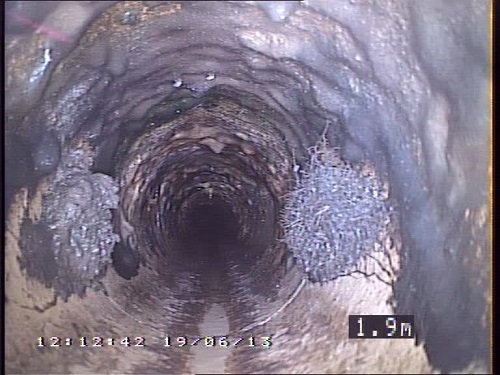 BlocksAway were called out by a despairing customer in Newmarket, who had been suffering from a horrible sewage smell in one of his properties, built only 9 months before. A succession of 3 plumbers had tried to find the source of the smell but to no avail; one had even installed a new vent pipe. 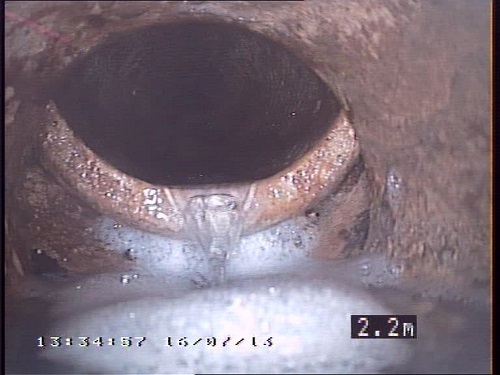 Steve did an initial cctv survey of the underground foul drainage, but could discover no obvious faults. He then sealed off the drainage system outside and introduced 4 smoke bombs to dramatic effect! Smoke billowed out of a downstairs cupboard in the house; on removing the floor boards an unused but unsealed connection piece was discovered beneath, leading from the toilet drainage; if there had been a blockage further down the line this would have resulted in raw sewage filling the cupboard! the solution was to simply cap off the offending connector.